MEDELLIN, COLOMBIA - Colombian officials probing Monday’s crash that killed 71 people, including most of a Brazilian soccer team, face one of the rarest types of accidents and perhaps one of the hardest for families to comprehend, amid reports that the airplane had run out of fuel. Some 0.5 percent of accidents on record were blamed on low fuel, according to the U.S.-based Flight Safety Foundation. “It is not common,” said Paul Hayes, safety director at U.K.-based consultancy Ascend Flightglobal. Experts distinguish between fuel starvation, where there is fuel on board but something stops the flow, and fuel exhaustion, where tanks run dry. Colombian officials say there was no fuel on board when the plane operated by charter airline LAMIA Bolivia crashed into a hillside. Past fuel-related accidents have little in common, but some give clues to the way investigators may approach the task of unraveling this week’s disaster near Medellin in Colombia. In 1990, an Avianca Boeing 707 ran out of fuel and crashed after missing an approach to New York, killing 73 people. Coincidentally, the jet had flown in from Medellin, followed by an unexpected wait in the holding stack. U.S. investigators cited the crew’s failure to manage fuel or declare an emergency promptly — two possible scenarios likely to be examined in this week’s disaster. Crew behavior will not be the only focus. Recent probes in Ireland and elsewhere have shown that officials may probe deep into an airline’s processes and operating systems and, if necessary, the relationship between companies involved. “If it is confirmed that there was no fuel, then it will be asked why that happened. Was there a fuel leak? Was the amount of fuel placed on board the same as planned? Were there stronger headwinds than expected?” Hayes said. Among key areas for investigation will be the length of flight, reportedly at the edge of the BAe 146’s range depending on fuel tank layout, payload and weather. The aircraft had flown the same 3,000-km route in the opposite direction once this year, according to tracking site Flightradar24. “Judging by the long stage length, investigators will want to look at the way the aircraft was dispatched. What were the management and company processes that led up to the dispatch of this aircraft?” Hayes said. Experts stress it is too early to be definitive about this accident and that most crashes result from several factors. In the most recent accident blamed on missing fuel, 16 people were killed in 2005 when a Tunisian Tuninter ATR turboprop was fitted with the wrong type of fuel gauge. While the full history of Monday’s LAMIA flight and crew conversations are not available, experts said leaked recordings suggested the pilot had reported a fuel problem relatively soon after coming near its destination. Jets should have enough fuel to wait at least 30 minutes in a holding pattern and then divert elsewhere, Hayes said. U.K. investigators reading two cockpit recorders — one for voice and the other for data — on behalf of the Colombian inquiry will try to find what technical signals the crew received and whether they discussed the possibility of diverting or declaring a formal emergency earlier. Not all fuel shortages end in disaster, but such instances are exceptionally rare. In 1983, 61 passengers had a narrow escape when an Air Canada Boeing 767 glided from 35,000 feet in an incident nicknamed the Gimli glider after the place where it landed. In 2001, a Canadian Air Transat A330 with over 300 people on board glided for almost 100 miles to touch down in the Azores after the engines stopping working due to a faulty fuel line. 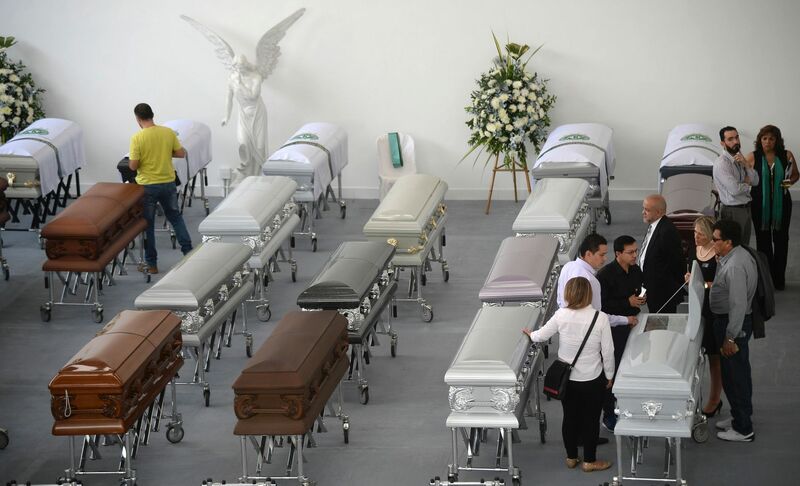 Bolivia’s Civil Aviation Authority on Thursday indefinitely suspended operations of the airline behind this week’s air tragedy in Colombia, as relatives of the victims spoke out in anger, many saying the crash was avoidable. The Bolivian agency said it was stopping all flights operated by LaMia airlines, amid reports its charter aircraft ran out of fuel moments before slamming into the Andes mountains on Monday, killing all but six of the 77 people on board. 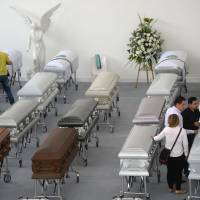 Many of the victims were players and coaches from a small-town Brazilian soccer team that was headed to the finals of one of South America’s most prestigious tournaments after a fairy-tale season that had captivated their soccer-crazed nation. Grieving relatives of the dead spoke out in disbelief and anger on Thursday after a recording of conversations between a pilot of the doomed flight and air traffic controllers, as well as the account of a surviving flight attendant indicated the plane ran out of fuel. Osmar Machado, whose son, defender Filipe, died on his father’s 66th birthday, questioned why the British-made plane, which was flying at its maximum range on the flight from Santa Cruz, Bolivia, was transporting the team. Williams Brasiliano, uncle of midfielder Arthur Maia, said the crash was avoidable if the team had chosen a commercial airline to travel to Colombia — not a charter. Meanwhile, British aviation authorities said the flight data and cockpit voice recorders recovered from the accident site were being brought to Britain for study. A recording of the exchange between the pilot and air traffic controllers, leaked to Colombian media on Wednesday, showed the pilot repeatedly requested permission to land because of “fuel problems,” although he never made a formal distress call. He was told another plane had been diverted with mechanical problems and had priority, and was instructed to wait seven minutes. As the jetliner circled in a holding pattern, the pilot grew more desperate. “Complete electrical failure, without fuel,” he said in the tense final moments before the plane set off on a four-minute death spiral. The recording appeared to confirm the accounts of a surviving flight attendant and a pilot flying nearby who overheard the frantic exchange. These, along with the lack of an explosion upon impact, pointed to a rare case of fuel burnout as a cause of the crash of the British Aerospace 146 Avro RJ85, which experts said was flying at its maximum range. At a vigil late Wednesday, thousands of soccer fans jammed the stands of the 40,000-seat stadium where Brazil’s Chapecoense team had been scheduled to play Medellin’s Atletico Nacional in the Copa Sudamericana finals. With the words “Eternal Champions” blazing on a big screen, the Atletico fans paid tribute to the rival team, which they have urged be named the champion. The emotional high point of the tribute was an address by Brazilian Foreign Minister Jose Serra, who traveled to the city along with a military cargo plane to help repatriate the bodies of the mostly Brazilian victims. He noted that both teams shared the same green and white jersey colors, calling it a sign of unity amid tragedy. In Brazil, the mood was even more somber as residents of the small agricultural town of Chapeco gathered in the team’s stadium for a Roman Catholic Mass with relatives of the victims and the players who didn’t travel with the team to Medellin. At a time when they had expected to be watching their team on TV, more than 22,000 Chapecoense fans tearfully watched videos of tributes that poured in from around the world. Chape, as the team is called locally, reached the top of South American soccer without any superstars or players from Brazil’s celebrated national team. Its run to the finals of the Copa Sudamericana impressed fans across the continent as it knocked out some of South America’s legendary teams.